2 Major Animal Abuse Stories – These People Are A Danger Walking the Streets – What Next ? – Children ? 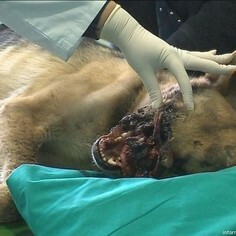 Here is EXTREMELY GRAPHIC footage of Vucko being examined by vets. Notice the firework’s shell casing still embedded in the dog’s head. We must bring the animal abusers to justice and ensure that this inhumanity is never repeated; sadly, animal welfare laws are practically nonexistent in much of Eastern Europe. Sign this petition urging Bosnian authorities to hunt down the guilty parties, expose the severity of animal abuse, and create proper legislation that will protect animals. Don’t let Vucko die in vain! Pas Vucko je uzasno stradao kad neki su zalepili vatromet za usta od psa I zapalili to. Od explozije je pas tesko bijo ranjen u lici. 5 dana se vrtio u ulice od Sarajevo dok su ga nasli. Na zalost nista nije se moglo ucinit da se ga spasi i Vucka se trebalo eutanizirat. Te ljude koji su ucinili tu uzast bi trebalo da se osudi. Please share Vucko’s story on Facebook. I just signed the following petition addressed to: Chairman of the Council of Ministers of BiH, Dr. Nikola Špirić. I am deeply concerned by the most recent event of animal abuse in Ilidza, Sarajevo, where a group of unidentified perpetrators put a firecracker into the mouth of a stray dog, which exploded and completely destroyed his upper jaw. The dog was found after a couple of days and taken to the vet, where he was euthanized due to excruciating caused by this inoperable wound. Sadly, this is not an isolated act of violence but the mayhem of ongoing neglect and animal abuse. The signatories of this petition demand strict implementation of the existing Law governing the welfare of animals. It is of major concern to the citizens throughout BiH that the laws are not upheld and that the crimes of animal abuse go unpunished. Such violence keeps spreading with disastrous consequences both to people and to animals. pose a serious threat to the civil society. A volume of contributions to the 2007 international conference at Oxford (Oxford Centre for Animal Ethics), on the relationship between animal abuse and human violence. I urge you to take steps that the Law on Animal Welfare introduced in 2009 is applied in this particular case, as well as on all other cases of animal cruelty towards stray dogs and cats. *** ARTICLE No. 2 *** – Another Dangerous Pervert to Animals and Humans ! 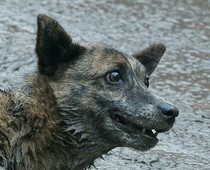 Torturer of 100+ Dogs Alexey Vedula Deserves Maximum Punishment! 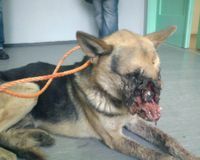 Sponsored by: People for the ethical treatment of animals in Ukraine! 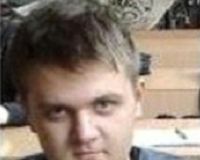 UKRAINE — Since October 2011, Alexey Vedula, a 19-year-old student, has been publishing atrocious videos on the Internet which feature him torturing and killing dogs in various extremely cruel ways. Alexey is filmed throwing puppies on the railway and watching trains run over their little bodies. 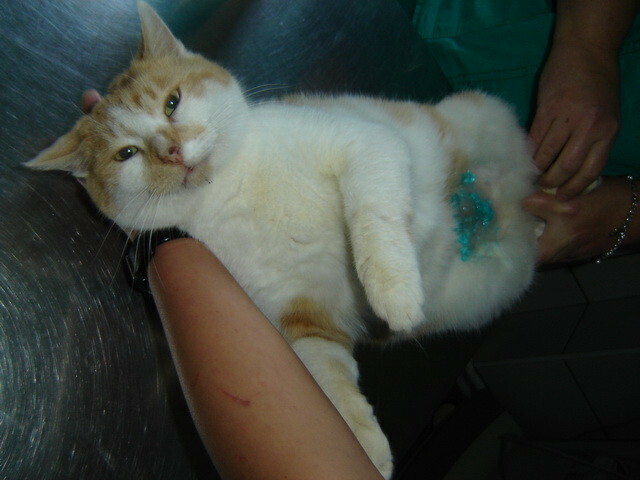 He is also seen cutting off their tails and paws, ripping open their stomachs and pulling out their eyes. All the while, he and his friends make cynical comments and laugh. Alexey Vedula tortured over 100 dogs to death and published these videos on the site Vkontakte.ru, where he and his friends discussed new methods of torture. More information here. Because of the indifference of Ukrainian authorities, this man is still free! The strictest punishment for his actions is a small fine of 850 gryvnas ($100 US) or a six-month imprisonment. This young man is sick and we all know he will never stop. It is a well-established fact that animal torture is an early sign of violent criminal behavior. If Alexey finds pleasure in torturing and killing helpless little creatures, will he eventually turn to children? 1. The minimum term of imprisonment for the cruel animal treatment which leads to death should be at least 1-3 years without a chance of probation. 2. Every branch of power shall obey this law because now most of the claims about animal mistreatment are ignored. 3. Ukrainian officials who are responsible for the compliance with this law shall be punished accordingly for ignoring the failures in a form of fine, and if repeated, – in a form of dismissal. If we don`t change it now, we will not be able to change it for the long time to come. We want Alexey Vedula isolated from society, in a maximum security prison, for as long as possible! Romania: Take URGENT Action for Strays Now – We Have Little Time Remaining – PETITIONS. Please click on the following link which will give you access to several petitions for Romanian strays. Please sign both urgently; there is only a week until a decision is made if it will be legal to slaughter Romanian strays. Unfortunately, I have some very sad news to share. After months of world-wide demos, national flashmob protests, hundreds of petitions, vote delays and false hope – the Romanian Chamber of Deputies has today pushed through the vote for mass killings to commence. The only remaining step is for the Romanian President to ratify the proposals and then the slaughter begins (….it has started already in many places in anticipation of this final act). The PD-L party have at last managed to seal the fate of hundreds of thousands of strays and public shelter dogs who will be killed using the cheapest possible methods many of which will be illegal and barbaric. The collection, incarceration and finally the incineration of the murdered dogs is big business for many corrupt officials and the companies they employ to do this dirty work and they just cannot let this golden opportunity pass them by. It seems that everything possible has been done by so many NGO’s and animal welfare groups/individuals but ultimately to no avail. That said, Carmen Arsene who as spearheaded the political campaign against the vote from the very beginning is urging us all once again to lobby the key players below one last time in the hope that they might just show mercy and reconsider if the outpouring is large enough. Please take just 5-minutes to do this and then share and crosspost to all friends, family and colleagues. Many thanks and I will as always continue to keep you posted…. Chrissy – Romania Animal Aid – London. The business industry made by the profiteers around stray dogs has won. The dog killing has been adopted today by the Chamber of Deputies of Romania. The next step is its promulgation by the Romanian president, Traian Basescu. Minimum chances we still have by attacking the law at Constitutional Court of Romania that must be done immediately. 50 deputies must sign the request. Minimum chances because the corruption is everywhere and the Court is under the control of the same killing party: PD-L. In this form the mass atrocities will begin and the stray dog situation remain the same. Romania: The Hated Nation of the EU Who Complies With No Regulations. The Bent and Corrupt PD-L Party Wins the Vote To Kill All Stray Dogs. We Have One Last Chance to STOP This – E Mail the Contacts Below Please – Do Not Delay – Do It Now ! 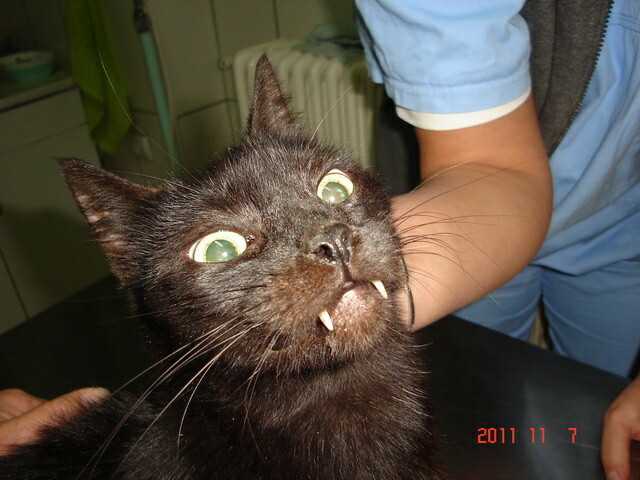 Serbia: Financial Appeal To Help The Cats This Winter At Felix Shelter. 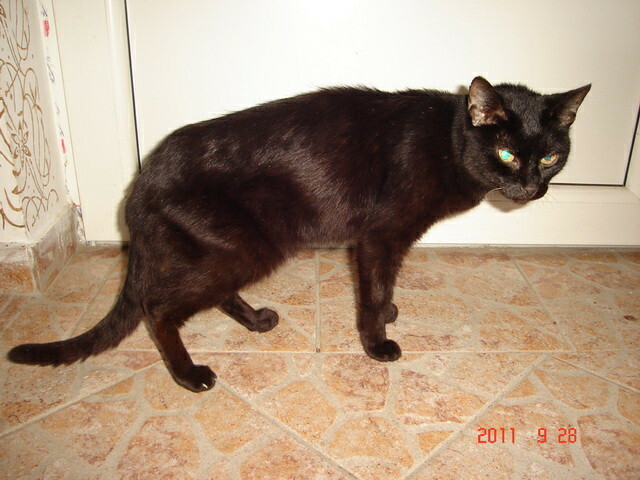 Danica has been in contact today (23/11) – the situation at Felix shelter for cats is very bad at this time of year. 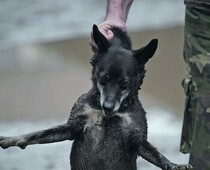 Please do everything that you can to help Felix shelter. Below you will find contact, website and Paypal / card donation information should you wish to help with a donation or financial support. Thank You – Mark – SAV. Winter is approaching fast, it is getting colder and colder every day and this chilly, wet weather affects almost all of my kitties so they are getting sick more often. Especially sensitive are the oldest cats, the chronic patients, and the new kitties that arrived this year and are not yet fully adapted to the life in the shelter. A virus is making rounds, causing fever, sneezing and discharge from the eyes. 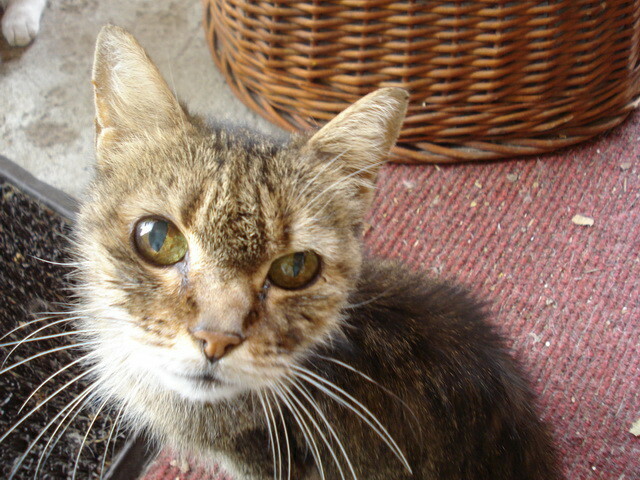 Older cats are not eating well and are lethargic – I honestly hope they can survive till spring. The fact that some of them are over 15 years old makes me even more preoccupied. One of my chronically ill kitties with FUS is in crisis again, like last year when he barely made it through the cold months. 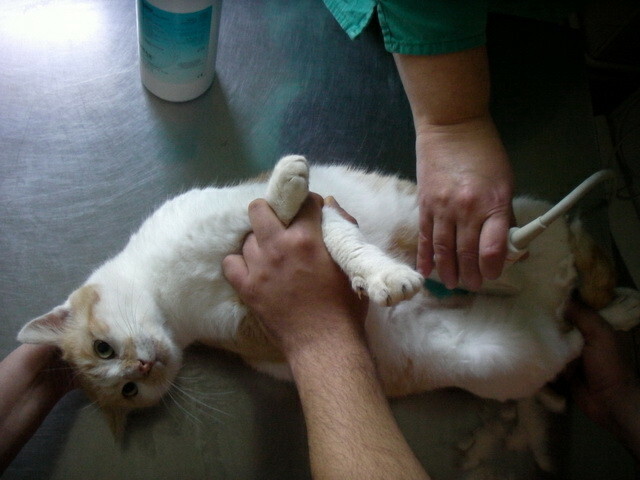 Many recently arrived kitties are already under treatment. With every new day new problems appear and it’s hard and exhausting for me but I won’t let my kitties down. Every kind of help is greatly appreciated and more than welcome. 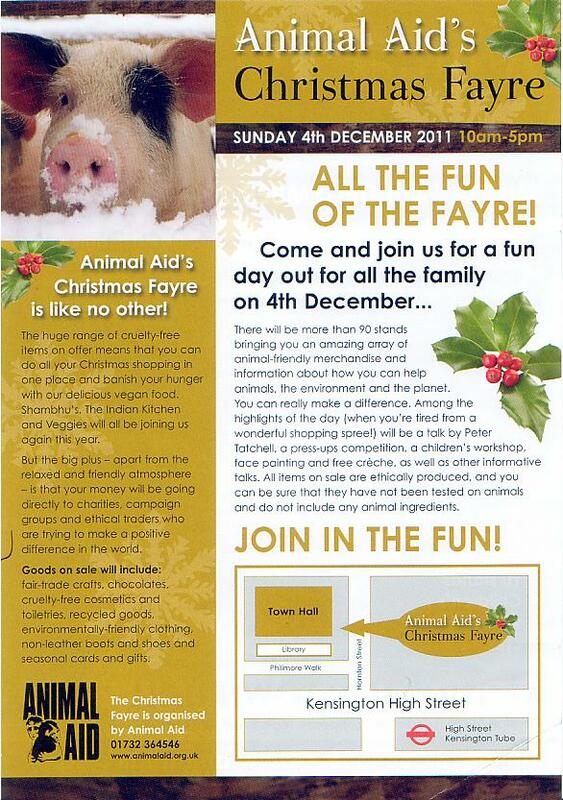 England (London): Animal Aid’s Annual Christmas Fayre – Sunday 4th December 2011. 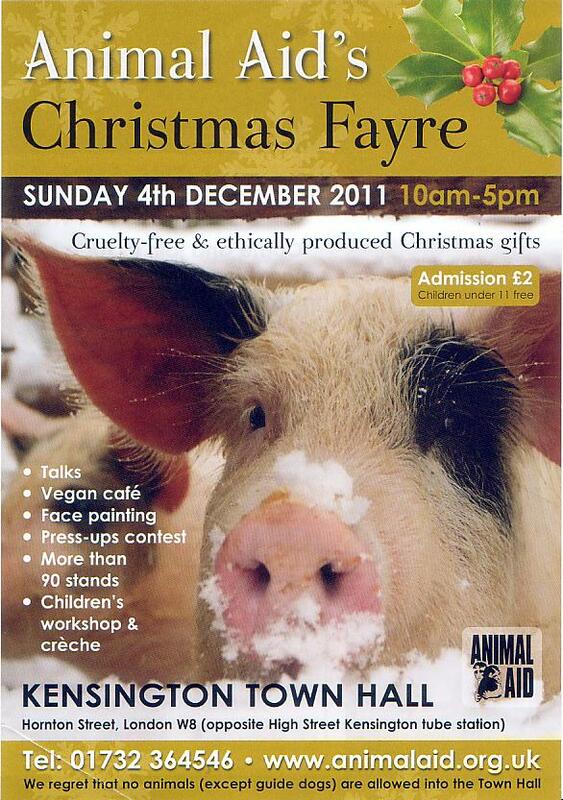 90+ Stalls, Vegan Cafe, Childrens Workshop, and Lots More. Serbia and the EU: Does the EU Dog Wag the ‘Environmental’ Tail, or the Serbian Government (EU Accession) Tail Actually Wag the EU Dog ?? This is the current situation regarding the EU and the subject of ‘Stara Planina’, Serbia. On 30th March this year, Nicholas Hanley at the EU responded to SAV regarding their original letter regarding environmental destruction taking place by the Serbian authorities at ‘Stara Planina’. I would like to thank you for bringing to our attention the information on the situation of the sites Stara Planina, Kopaonik and others in Serbia. The European Commission can only formally register complaints regarding non-respect of EU legislation in EU member states. 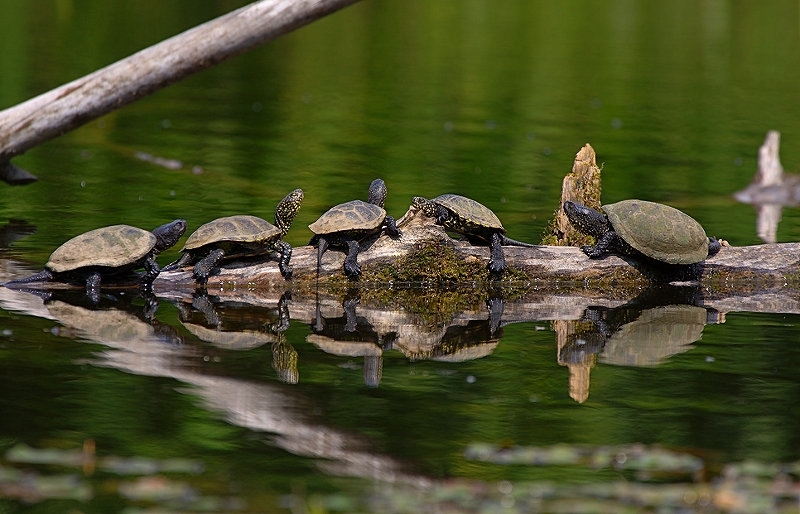 Serbia, as a potential candidate country to the EU, is not bound by EU legislation yet, so we are unable to take any legal action regarding complaints on environmental matters. However, the Commission is always open to receiving information from the public on the situation of environment in non-EU member states. The Commission is aware of the situation of the Stara Planina and we are addressing this issue in the context of the EU enlargement process. In this context and in order to receive updated information from the Serbian government, we are going to raise the question on the situation of the Stara Planina site at the next EU – Serbia Sub-Committee Meeting that will take place early April in Belgrade. I will be able afterwards to come back to you with more information. I would also like to take this opportunity to assure you that we are working with the authorities of Serbia to help them bring the environmental policy in the country up to EU standards. I write regarding your e mail which is provided below – regarding the situation of environmental (flora and fauna) destruction at Stara Planina in Serbia. I note from your mail that the specific issue of Stara planina was to be addressed with the Serbian government at the EU – Serbia Sub-Committee Meeting that I can only assume actually did take place early April in Belgrade. As I have not been provided with any information relating to the April meeting, and being asked of potential results by many associates within Serbia, I would be very grateful if you could provide me with an overview of the meeting, specifically relating to the Stara Planina issue, and what actions, if any, were proposed by the government of Serbia. As you say in your mail, ‘we are working with the authorities of Serbia to help them bring the environmental policy in the country up to EU standards‘; I therefore trust that the Serbian government was informed at the April meeting about the environmental destruction they have taken at Stara Planina and that in order to rise to ‘EU standards’ when they become a member state, they are making necessary changes to their environmental destruction approach, which has been clearly demonstrated at SP. When you have time; I would appreciate an update on the situation of Stara Planina and the information provided by the Serbian government. I would like to provide my international supporters http://www4.clustrmaps.com/counter/maps.php?user=9b44b4e0 with an update of the current situation of / at SP. Founder – ‘Serbian Animals Voice’ (SAV) – Kent, England, Uk. On behalf of Mr. Hanley, I would like to inform you that we have raised the issue of Stara Planina during the meeting with the Serbian authorities in April 2011. However, due to the heavy agenda and the limited time available for the discussions, it was agreed that information will be submitted to the Commission in writing. We will keep you informed once we have received more information from the Serbian authorities. So, the EU Environmental people are too busy to deal with environmental issues which affect potential future EU member states ? As a result, SAV founder Mark Johnson yet again responded to the EU on 31st July 2011, expressing major concerns that the EU really has no power, or does not appear to hold any power, with future EU accession member states (Serbia), and that the EU is simply powerless and is being completely dictated to by those who are causing environmental destructions as seen at Stara Planina, namely the Serbian government. I thank you for your mail of 29 July, as shown below. “The main role of the European Commission’s Environment Directorate-General (DG) is to initiate and define new environmental legislation and to ensure that agreed measures are put into practice in the EU Member States“. Despite what you say and with all the good intentions; I find your response completely unacceptable. “The Commission is aware of the situation of the Stara Planina and we are addressing this issue in the context of the EU enlargement process. In this context and in order to receive updated information from the Serbian government, we are going to raise the question on the situation of the Stara Planina site at the next EU – Serbia Sub-Committee Meeting that will take place early April in Belgrade. I will be able afterwards to come back to you with more information”. 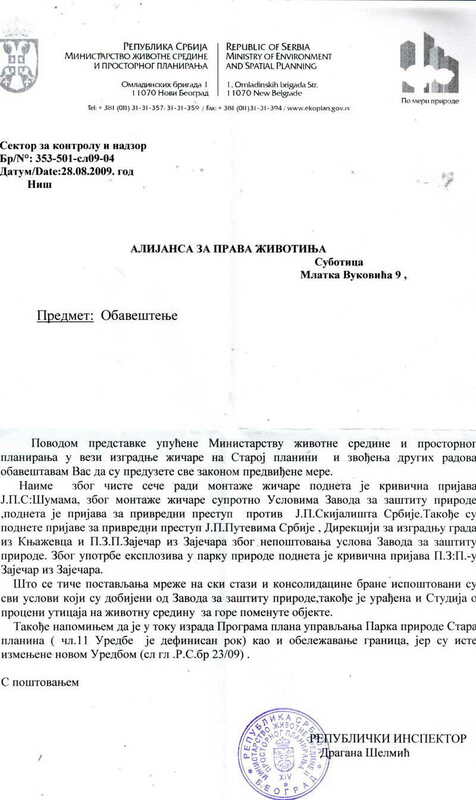 Your mail of 29 July can provide me with no further information other than to say that you have left the issue of Serbian flora and fauna destruction in Serbia with those who are performing Serbian flora and fauna destruction – namely the Serbian government. If my experience of attempting to deal with the Serbian government over environmental / animal welfare issues during the past 7 years has taught me anything, it is simply that Serbian government officials are bent, corrupt and will do everything iin their power to avoid having to respond to you, me, anyone about Stara Planina until all the destruction has been done; flora / fauna species have been depleted and certain Serbian officials havve money rolling in – to their personal backs pockets one would guess. 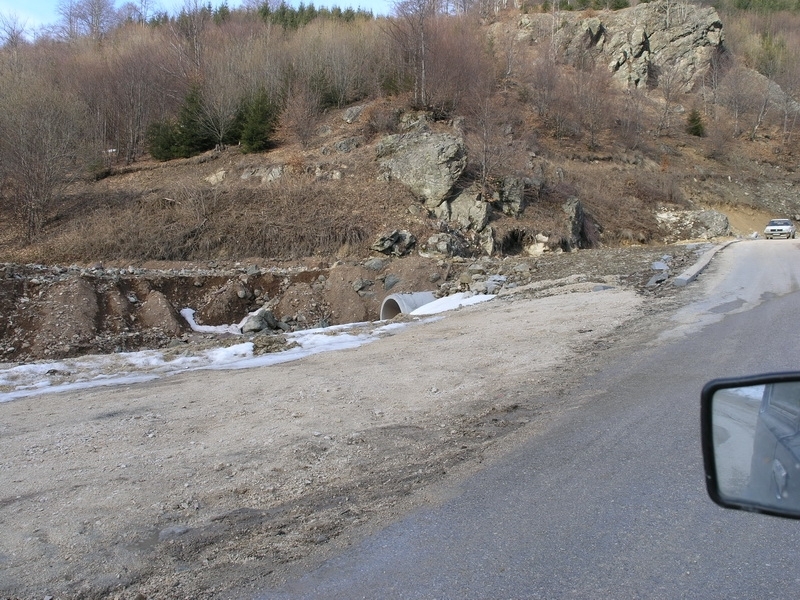 The EU is supposed to be fighting to stop environmental destruction at facilites such as Stara Planina. What we see as a result of your last meeting in Belgrade appears to be another ‘back burner job’ with the Serbian authorities setting the agenda and dictating to you when you will be getting a response about the environmental destruction that they are doing at Stara Planina. I guess that is very much a case of the Serbian government telling you what you wish to hear in order that the EU Accession door is kept wide open for their membership in the near future. Animals and plant species coming a very poor second. 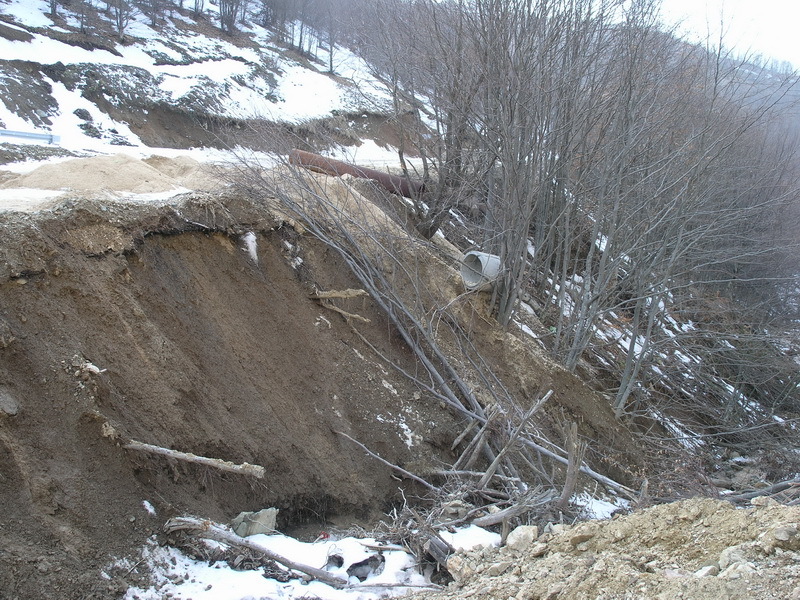 If anyone, either you (the EU) or the Serbian government, does care about environmental destruction in Serbia at locations such as Stara Planina, then can I suggest that your oh so busy time limited discussions should have been extended to consider such issues as environmental destruction in Serbia. Possibly you will learn to allocate more time for your next Serbian meeting so that Serbian environmental issues, which so many exiasting EU citizens have big concerns about, can actually be addressed and sorted out there and then, rather than simply being jotted down on notes, and responsibility for further actions being put back in the hands of corrupt politicians – those running Serbia. Please look at the photographs I am attaching and take time to ask yourself – is this something which should be left with bent and corrupt officials on the back burner of meetings with the EU ? – more continued destruction until the next important EU / Serbia meeting ? – then to be put off once again ? – I suggest not. Obviously you feel differently. So what power to the ‘EU man’ on issues such as this ? Lets say that if I have not had further response from the Serbian government and also yourselves on the issue of Stara Planinna by Monday 22nd August, I will be informing all global supporters to my site that the EU has left the issue of Stara Planina environmental destruction in the hands of those who are responsible for this exact thing; a bent and corrupt Serbian government. I hope and very much trust that you will inform the Serbian authorities that the issue of environmental destruction (by them) at Stara Planina is still being monitored by EU NGO’s, and that every attempt to expose the environmental destruction at this facility will continue to a global audience. Can I suggest that you provide me with a written copy of the Serbian government response on Stara Planina by Monday 22nd August, as I have no faith in being led up the written / verbal path that some future meeting of yours in Belgrade sometime in the distant future is going to do anything to halt the killing of species of wild animals and plants in the SP sector of Serbia. I very much look forward to your / Serbian government response by Monday 22nd August; otherwise it will then be necessary to make public, to EU government and international press, the failings which have taken place at the Belgrade meeting of April 2011. I very much suggest that they do and that you and Commissioner Potocnik ask them to act; and quickly. “The Directorate-General for the Environment is one of the more than 40 Directorates-General and services that make up the European Commission. Commonly referred to as DG Environment, the objective of the Directorate-General is to protect, preserve and improve the environment for present and future generations. To achieve this it proposes policies that ensure a high level of environmental protection in the European Union and that preserve the quality of life of EU citizens. The DG makes sure that Member States correctly apply EU environmental law. In doing so it investigates complaints made by citizens and non-governmental organisations and can take legal action if it is deems that EU law has been infringed. In certain cases DG Environment represents the European Union in environmental matters at international meetings such as the United Nations Convention on Biodiversity”. With all this past history and the complete lack of real involvement by the EU authorities to become involved, or take on board the issues raised about Stara Planina in Serbia; a potential new EU accession member state, it has been left to the NGO institutions such as Serbian campaigners and SAV to investigate further. Regarding his e mail of 30th March, and the declaration by Nicholas Hanley (EU) that “I will be able afterwards to come back to you with more information”; SAV have been provided with nothingapart from excuses as to why there has been no progression regarding EU awareness on the issue of Stara Planina. In our opinion, the EU are doing very, very little regarding the issue of Serbian environmental destruction with the Serbian government, who at the same time, ARE wishing to become EU members ! THE CURRENT SITUATION – 13th NOVEMBER 2011. Despite asking the EU for a Serbian government response on the issue of Stara Planina by Monday 22nd August; now on 13th November 2011, the EU (Mr. Hanley) has provided no further information to SAV. “I will be able afterwards to come back to you with more information”. 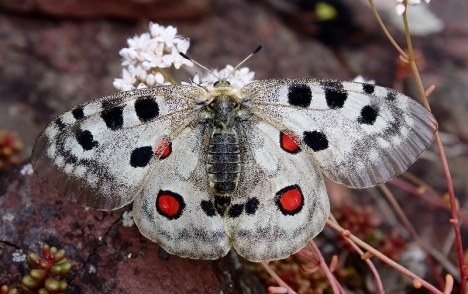 SAV would suggest that Mr. Hanley wishes to keep Stara Planina on the back burner; no urgency from him to follow up with answers from the Serbian government, whilst the EU environmental commission sits by and lets flora and fauna be destroyed at Stara Planina. If this is not the case, then where is our EU mail informing us of the situation ? The promise of – “We will keep you informed once we have received more information from the Serbian authorities”. EU and the Serbian government; – Does the dog wag the tail or is the tail wagging the dog ? Unlike being given any update for months from the EU, we at SAV have now been provided with an update by Dr.Miroslav Demajo, who has been a campaigner / adviser relating to problems associated with the Zvezdara forest in Belgrade. 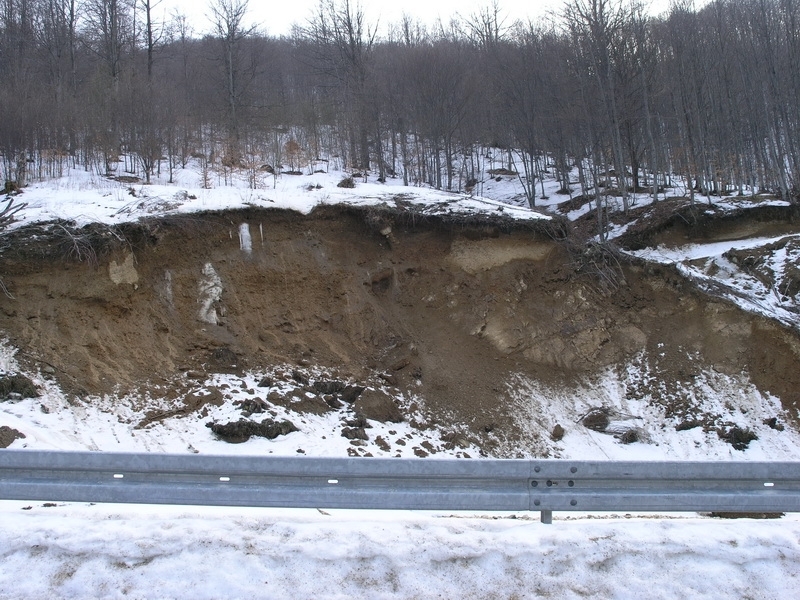 Despite being a protected area, and a long fight by environmentalists to stop road construction through the forest, there is still no result from the Belgrade City parliament, who should have voted on this issue way back around April 2011. Through environmental campaigners in Serbia, we can now focus again on the environmental situation at Stara Planina and the complete ignorance of the EU to really address the situation. The following are copies of the two documents issued by the Serbian authorities. 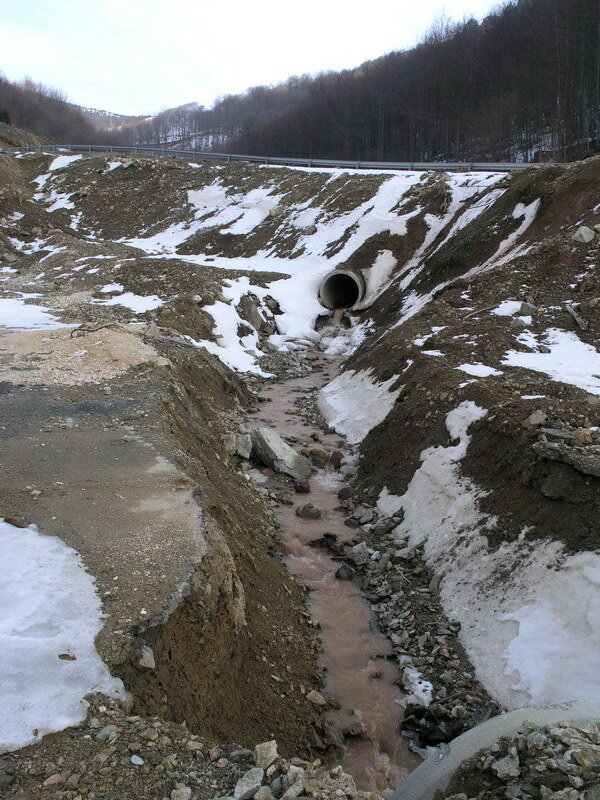 Below is the information provided to SAV by the Serbian environmental campaigners. 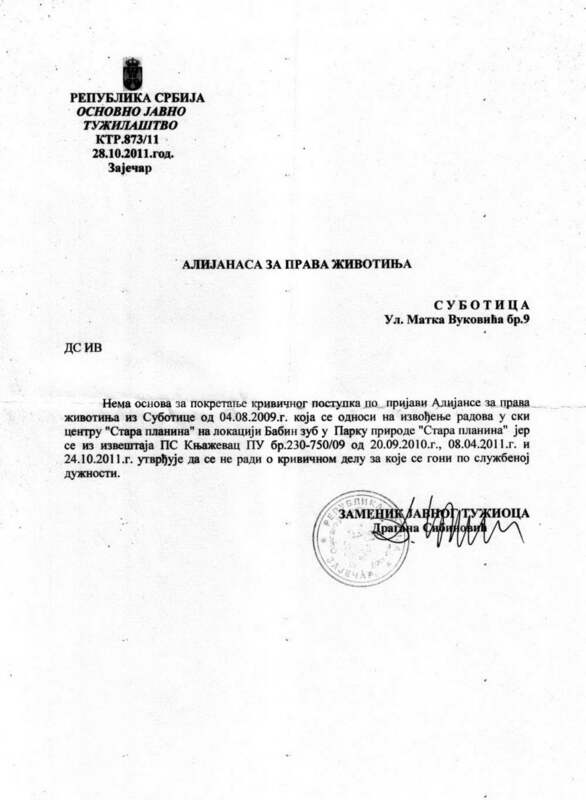 Attached are both documents, records of the inspection from the year 2009 and final answer – response of the public prosecutor of the municipality of the town Zajecar.. The response was after 2 years in order to be outdated and not valid anymore. The police investigation was opened in the police station in Knjazevac, police headquarters No. 230-75/09, ie in the year 2009 and continued after only one year ie. 20th Sept. 2010, and another two times, purely curtiously, 8th of April 2011 and 24th of October 2011, and according to this, they concluded (this we will ask for an insight, to get copies of these police actions and what they have written) that there is no basis for activating the procedure for a criminal offence which is subjected to be processed by official duty. In the records of the inspector, which they overlooked, IS stated the criminal offence as well as economic breach ie. feloney , so this was not processed as it should have been. All this they stopped and that is it. While writing the report, the inspector applied the then current rules and laws and at the time, this was to be further processed according to the then contemporary laws. Later they changed all of this, and this is it, the result, not valid anymore. This is an excellent example of how even when the inspector acts as he should, the prosecutor does not act or vice versa, in any way, it is the aim not to react. According to this, in case we are not satisfied and we consider that a law is infringed, they often write that we may complain that the law has been broken, in this case a protected natural region which belongs to all Serbian citizens, and that we may submit a private accusation / prosecution against whom we consider responsible and start a law suit process concerned with criminal acts etc. It is all Serbian citizens are damaged by these actions and government rulings which have not been undertaken correctly. These law suits are extremely costly and we do not have money for such activities, especially as all the inspector did as the official organ and as official duty, we would have to accuse the inspector also and all this as a private law suit. All this is happening as they do not know what to do with us as all trials to bribe us failed, we are immune to pressures, we always only try the application and respect of current Serbian laws, nothing more and nothig less, this is basic. As a consequence of not applying Serbian laws, one of the condition of Copenhagen Documents and EU membership, that every country must apply and respect current laws, in order to avoid violation of human rights, we consider that our human rights are threatened as the country usually does not apply them, it does not respect and process laws, thus we live in a jungle where the rules are the stronger rule, by those who steal the money and undertake other criminal activities. It is not a secret that Serbia is highly ranked in corruption, and that political parties are in deals with rich businessmen (who amounted riches thanks to the period from 1991 up to now). There is no basis for processing the criminal act under the accusation submitted by the Alliance for Animal Rights from the 4th of Augustn 2008, concerning the construction in the ski center „Stara Planina“, located at Babin zub within the Nature Park „Stara Planina“ based on the report of the Police Station Knjaževac from Police Headquarters under No 230-750/09 dated 20th Sept.2010, 8th April 2011 and 24th Oct. 2011, this being a criminal act to be processed on official line of duty. 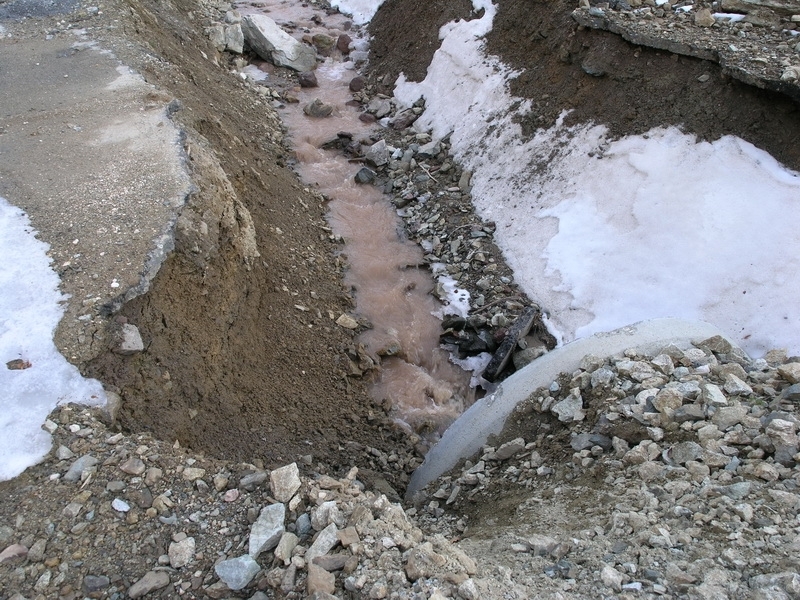 According to the complaint forwarded to the Ministry of the Environment and Spatial Planning concerning the construction of ski lifts on Stara Planina and other constructions, we inform you that all legal measures have been taken into account. Due to the clear forest cutting with the purpose of constructing the ski lift, an official criminal offense accusation was filed against the Serbian Public Company “Srbijašume” (Forest Company, translation) for ski lift construction contrary to the conditions set by the Sebian Inst. 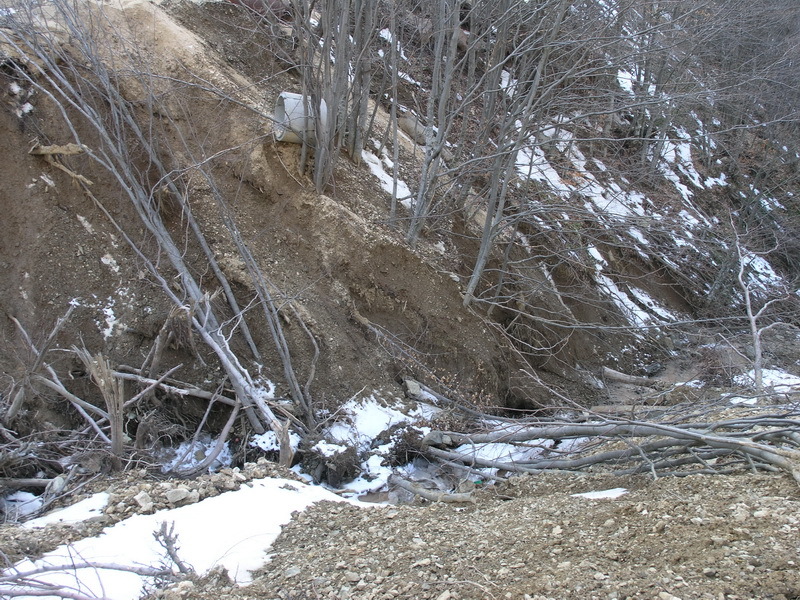 For Nature protection, with prosecutions filed against 2 other subjects on the basis of economic felony, Public Company “Putevi” (Roads, translation) and Directory for Town Construction Zaječar for not complying to the conditions set by the Serbian Inst, for Nature Protection. For using explosives inside the Nature Park, prosecution was filed against Company ’Zaječar’ from Zaječar. Concerning the placement of nets on the ski path and consolidation of dam, all conditions were met as set by the Inst. For Nature Protection. 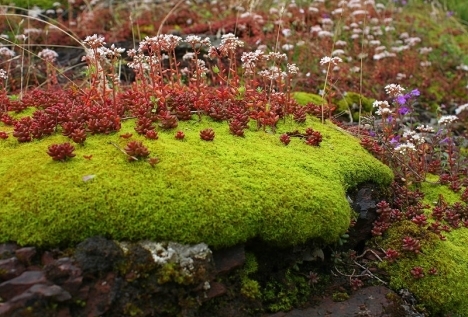 Also The Study on the Evaluation of Environmental Impact for the above objects was obtained. I also note that the Program for the Management of Nature Park ’Stara Planina“ (the end date for this set by Decree, article 11) is prepared as well as the definition of new Park boundries changed by the new Decree (Official Gazette, Rep. Of Serbia, No 23/09). How very typical that Mr. Nicholas Hanley at the EU and his senior Commissioner have failed to undertake all the necessary investigations and actions associated with Stara Plannina and Serbian EU accession regarding the ‘rule of law’; implementation of which is a fundamental requirement for both existing member states and those currently seeking EU accession, such as Serbia. In this case, the EU has failed and failed well. As we have said in the past, Serbia is bypassing the rule of law and simply making up its rules to benefit its own, corrupt government and corrupt system. And all the time, the EU ignores the warning signs as we have presented to Mr. Hanley; instead it talks tough, actually having as much clout with future EU accession member state governments as a damp feather waved in a hurricane. But despite this, all the time, animals are being killed and the environment destroyed. The EU has failed on the issue of Stara Planina. Hopefully, this report will bring an all too late response from Mr. Hanley; but even a late one is better than the ‘nothing’ we have had to date from the EU relating to actual EU progressive action with the Serbian authorities at Stara Planina. Months and months of broken promises by the EU and a bent, corrupt Serbian government which wags the ‘EU Dog’. – ‘what is the EU actually doing about future EU accession states such as Serbia and the implementation of the rule of (environmental) law ?’. We suggest this can be answered in one word by the EU – ‘NOTHING’.